A person never knows what desires will awaken inside him a moment later. He is also unable to determine the direction of his desires. A person is ignorant of his future state. Humanity has always been interested in knowing its future state, but has never been able to satisfy its interest. All of our speculation is rooted in the fact that the future is unknown to us. Why is it so? The reason is our ignorance of the system in which we exist. Actually, it’s quite a simple system of mutual connections between all of us. We are the ones who determine these mutual relationships. I shape your condition with my thoughts, and you do the same to me with yours. My subsequent desire is a result of the desires of other people who are within the system, since we are absolutely mutually interdependent. If I think good thoughts that will make you think similarly. If what I have is bad thoughts, you will have bad thoughts too. It’s similar to the situation, where a victim causes the appearance of a murderer, as if both of them determine and seek one another. You are placed inside a network. The sum total of everyone’s state determines your state, the way you feel, think, want and react. You act unconsciously; you don’t have your own free will! Besides that universal mutual interdependence, there’s a plan at work, a program that leads all the souls to a pre-determined goal which is total harmony and absolute connection between them. The process of our development is a process of purification, awareness and understanding of how each individual can consciously take part in it. 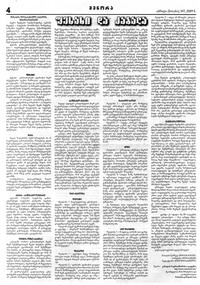 A series of articles dedicated to the Jewish holidays Hanukah, Purim and Pesach were recently published in the Georgian Jewish newspaper Menora. The material was prepared by Nino Chirikashvili, Miriam Beren, Meir Hanan, Tamara Kricheli, and the newspaper’s editor is Guram Batiashvili. News Report (translated from Cursorinfo): In a survey of Russian immigrants in Israel, 75% feel that Orthodox Jews are meddling with their lives. The majority of respondents are of the opinion that religion and government in Israel should be separated. The pressure and limitations imposed by the religious interests only intensify the hatred for the Orthodox and deepen the schism between the secular and religious groups. My Comment: The following steps are necessary to completely separate religion from government: Do away with all compulsory religion-driven conditions and laws, and form a joint institute of secular-religious consensus. By practicing love of others (love thy neighbor is the main rule of the Torah! ), the Orthodox will ensure that religion is understood and accepted, and not hated as it is today. Their current behavior reveals the avarice of religious institutions and their opposition to the commandment of love of others. As with all the other commandments, they stole it from Kabbalah, though they don’t have the means to actualize it – the Upper Force. Musings on true religion: To be religious is to act for the benefit of others. Because that is the nature of the Creator, everybody must achieve such an attitude toward others. The mission of a religious person is to help others become like that. There is only one religion – Kabbalah. All earthly religions are formations of egoism, with their purposes being absolutely egoistic. All religions separate and control people, whereas the essence of religion must be to eradicate the egoism within man! Religion must create the conditions wherein man could turn himself over, just as soil is turned over when it’s being plowed. Religion must create an environment that would force everybody to change their mentality and values. “Force” because otherwise man cannot change himself, no matter how hard he tries. One of the primary intents of religion is to put everyone on the same level, regardless of religious title, social or economic status – be it king or slave, rich or poor – everyone is equal. Man is judged solely on his love of others, and not by his adherence to rituals. A religious person cannot possibly despise others (non-religious, people of other faiths or ethnic backgrounds). The ruin of religion is that people begin to exalt it, and in so doing exalt themselves through association. Thus religion turns into another form of power! Religion is one’s personal link to the Creator which stems from the feeling of merging with all of humanity. That is why religion is a personal and private matter, and ought not be subjected to outside evaluation. The mission of a religious person is to inject the sensation of the Creator, the Upper life into our world. A question I received: If a person tries to realize the principle of love for the neighbor right now, he will feel like a sheep in a pack of wolves. Where can he find adherents to support him? My Answer: Why would he feel like a sheep in a pack of wolves? If a person opens a business without the intention of making additional profit, he will cover all his overhead expenses, expenses for the salaries of his workers, – everything except additional income, which is of no benefit to anyone for the vital necessities of life. Therefore, he lowers the previously established price of his goods and offers people the goods at a price that is 10 or even up to 30 percent cheaper than what others sell them for. Businesses, which don’t place receiving a profit as the primary goal will flourish, and this is not considered to be a “sheep in a pack of wolves” in any way. You are the owner of a business you live a normal life and receive a salary, like all of your employees. We all need to cover expenses, including establishing a retirement fund, paying for medical insurance, and so on. We should live normal lives, go on vacation, and have everything that is necessary; we just don’t have anything in excess because we don’t need it. Let everyone else equalize to us at the expense of our surplus.